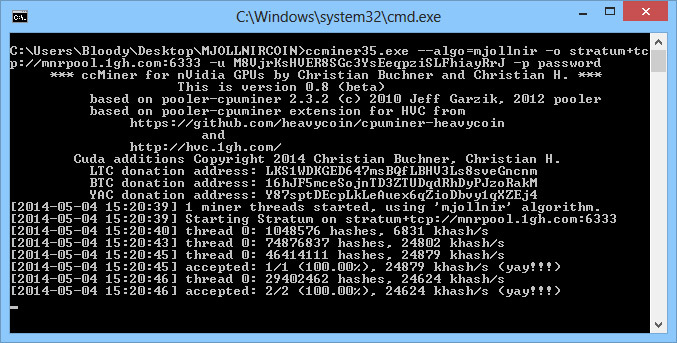 The ccMiner software miner for Nvidia GPUs has received an update to version 0.8 (source) adding support for Mjollnircoin (MNR) mining. This new coin has been just recently launched, and then again just relaunched with some glitches, but there is still some interest from users, so you might want to give it a try, especially if you have Nvidia-based GPUs for mining. We are currently getting about 25 MHS with a GeForce GTX 780 Ti video card mining for Mjollnircoin and with enough interest this new coin might replace the also HEFTY1-based HVC crypto currency that has been going down lately.